Posted January 31st, 2017 & filed under News. Last night, January 30, Judge Schreier issued a stay of her order in the Argus Leader Media vs USDA lawsuit. You will recall that the Argus Leader newspaper in South Dakota had sued USDA for SNAP retailer redemption data by location. NGA has long fought the release of this data arguing retailer sales data is proprietary and confidential information and should be exempt from any FIOA request. Late Friday (January 27) night a motion to intervene in the case was filed by FMI. As you will recall, NGA has been very involved in this case from the beginning and supported the legal recommendation of our counsel and others to have FMI file the motion to intervene given NGA’s involvement in the case, including testifying at the trial. We all thought this would likely be our best shot at success. NGA filed an affidavit in support of the motion as did another NGA member and a number of other retailers. The judge grated the motion last night which gives FMI 15 days to file an appeal. Because of the Court’s action no retailer information will be released today by USDA as had been previously planned. Posted January 20th, 2017 & filed under News. USDA’s announcement is in direct response to a November 30, 2016 court ruling from the US District Court of South Dakota in the case Argus Leader Media vs United States Department of Agriculture. In August 2011 the Argus Leader (South Dakota newspaper) sued USDA for annual SNAP store sales data after USDA denied a Freedom of Information Act (FOIA) request for the data. The National Grocers Association has long been adamantly opposed to release of retailer sales data, arguing that this sales information is proprietary and may be used by competitors to cause harm. NGA filed extensive comments over the years urging USDA to not release this data. On May 26, 2016, NGA President and CEO Peter Larkin testified at the trial on behalf of USDA as a supermarket industry expert that SNAP store data should remain private and confidential. NGA has confirmed with USDA that this data will be released to the Argus Leader Newspaper per its original FOIA request. It will also be published on USDA’s website and include information on whether the store is currently active, disqualified, or withdrawn. 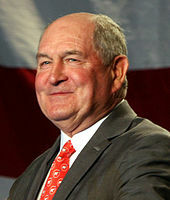 Former Georgia Governor and state senator, Sonny Perdue, President Trump’s campaign agricultural adviser has been nominated to be the Secretary of the US Department of Agriculture. A trained veterinarian and well known on Capitol Hill, he’s been endorsed by the American Farm Bureau Federation, the biggest U.S. farmer group. A former Democrat he switched to the Republican party in 1998. Currently an agribusiness trading company founder his confirmation is likely to swift. Posted January 15th, 2017 & filed under News. The Food and Nutrition Act and SNAP regulations allow a state agency to require that an EBT card contain a photo of one or more members of a household if the state agency can also establish procedures to ensure that any other appropriate member of the household or any authorized representative (including individuals permitted by the household to purchase food or meals on its behalf) may utilize the card, regardless of whether or not they are pictured. No other forms of required identification, other than a photo on the EBT card, are authorized by the Act or regulations for redeeming SNAP benefits. Posted January 9th, 2017 & filed under News.